Regular video report of my neural network result. Added enemies and you can see, that agents starts to avoid them. On the video, agents trained about 40 min and was chosen 8 best for continue training. I was used genetic algorithm combined with neural network. Signals of agent are: 1-agent's health, 2-closer food distance, 3-closer food angle, 4-closer enemy distance, 5-closer enemy angle; Agent can see only on his view field (gray circle). Agent needs for increment his fitness for reproduction. It's depends on food eaten (fitness increment) or enemy contact (fitness decrements). P.S. It is continue of the topic "Neural Network and Qlearning. Survival agents." The bots behave very realistic. Did you compare your solution with other IA algorithms? I saw at the movie that you are using four layers, input layer, two hidden and output layer. 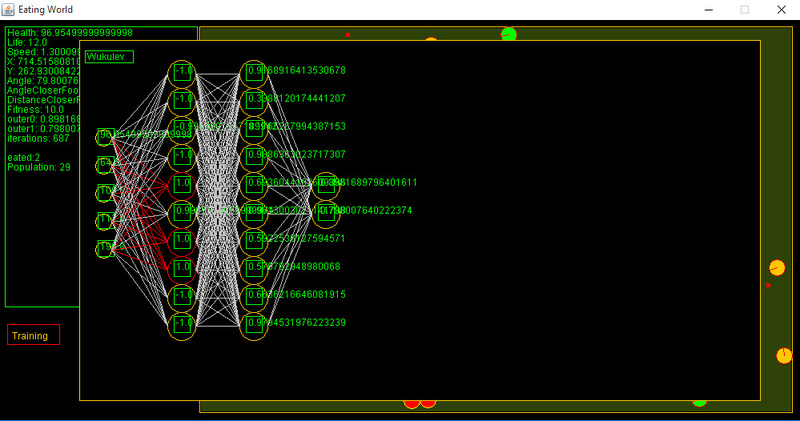 Usually three layers are enough for multilayer perceptron neural network. Did you experiment with different number of layers? Are you going to prepare a library based on your solution or just want to use it in your games?